This rice bowl is one of our go-to meals when we're craving something refreshing & light. Mango, ginger, and basil add a wonderful freshness here. I got such a wonderful response to that series, so I thought, let’s do it again! I chose this particular week because it’s summer(!) which means that we’ve been spending more time outside, more evenings strolling our neighborhood, and more time eating out. I love to eat out, but after a while, I’m ready to start eating in again. 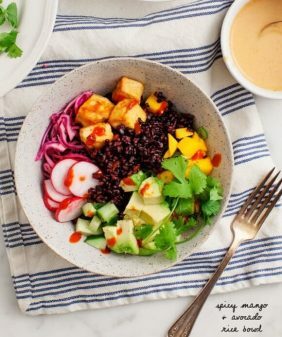 So here’s the first recipe for the week: this super refreshing Mango Black Bean Ginger Rice Bowl. This is basically a burrito bowl with Asian-ish flavors. 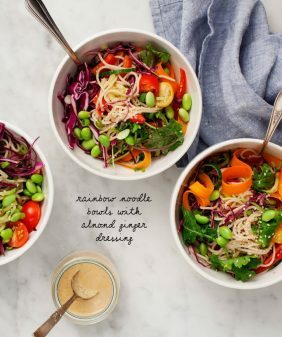 What’s in this rice bowl recipe? If you’re a fan of our cookbook, you’ll recognize the sauce/dressing here – it’s a light tamari-lime vinaigrette, similar to the one that I poured over the Brussels Sprouts with Coconut Rice on page 63. I’m crazy for this dressing because it’s so simple but seriously flavorful – perfect for a bowl with many components. 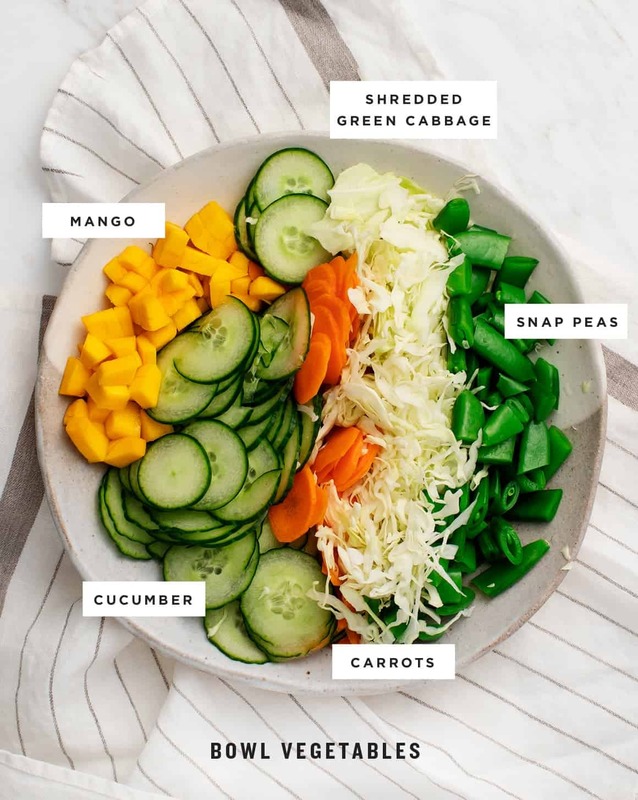 Along with the sauce, I filled these bowls with mango, black beans, shredded cabbage, and a few crunchy veggies – blanched snap peas, sliced cucumbers, and carrots. 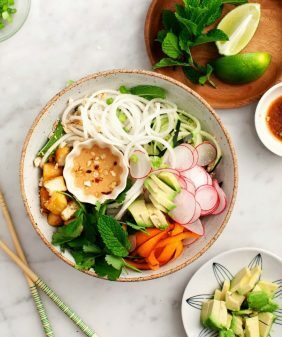 The interesting pops of flavor come not only from that dressing, but also from pickled ginger, sliced basil, and a combo of toasted peanuts and sesame seeds. (If you’re nut-free, skip the peanuts and just go for the sesame seeds). 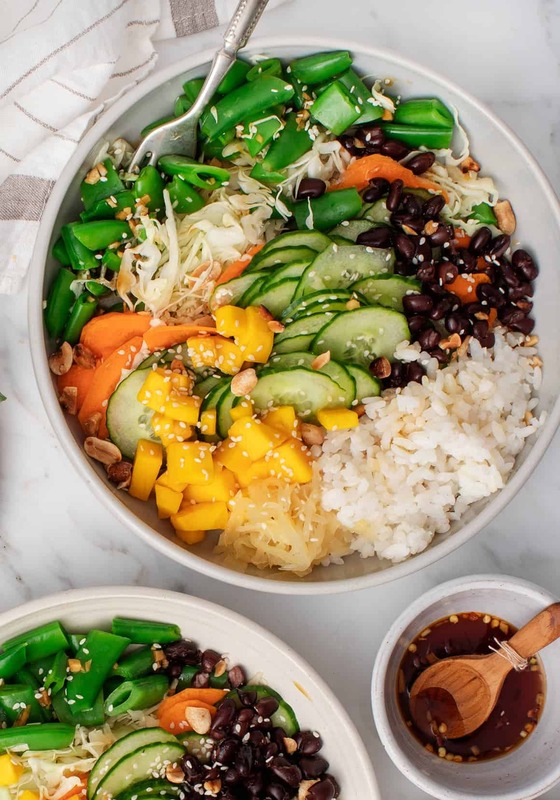 This rice bowl is everything I want to eat in the summer: it’s light, crispy, crunchy, and herby with a light sauce and a great pop of sweetness from the mango. 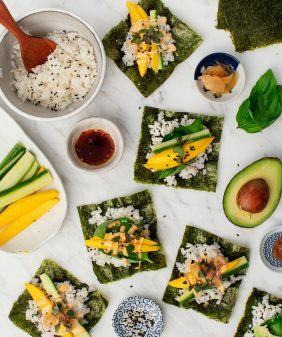 If you’re looking for the rest of this 3-day meal plan, check out these nori wraps and these mango tacos, and then find the grocery list here. 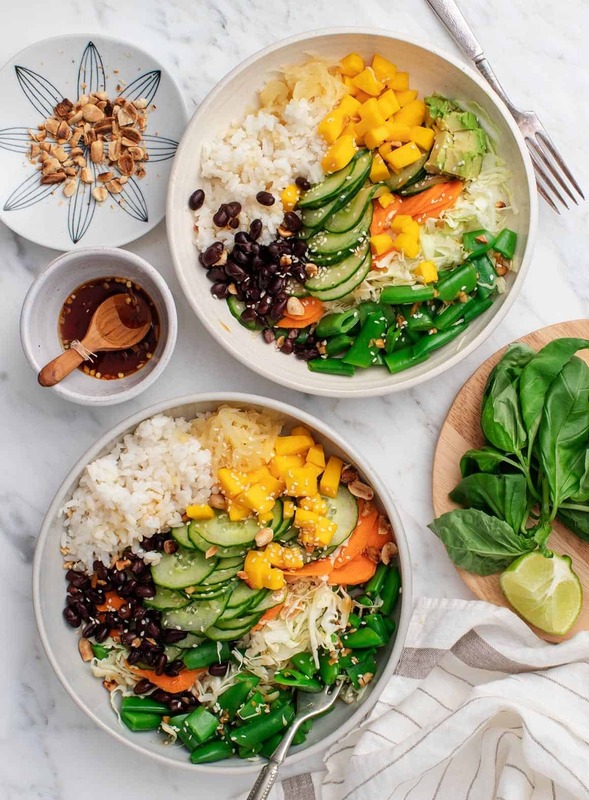 Mango Black Bean Ginger Rice Bowls are one of my favorite healthy summer meals - basil, mango, and a light sauce add a punch of flavor to a hefty serving of crisp veggies. Make the dressing: In a small bowl, whisk together the tamari, vinegar, lime juice, garlic, cane sugar, and sriracha. Bring a small pot of salted water to a boil and place a bowl of ice water nearby. Blanch the snap peas by placing them in the boiling water for 1½ minutes, then scoop them into the ice water to stop the cooking process. Once cooled, drain, pat dry, and chop. 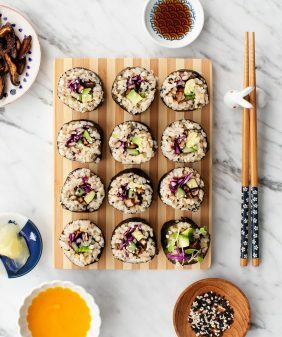 Assemble the bowls with the rice, shredded cabbage, carrot, cucumber, mango, black beans, pickled ginger, and basil. Top with the toasted peanuts, sesame seeds, and avocado, if using. Drizzle bowls with half the dressing and serve the rest on the side along with tamari and sriracha, if desired. *depending on how much rice you like in your bowls - I like ½ cup in mine, my husband Jack prefers 1 cup in his. 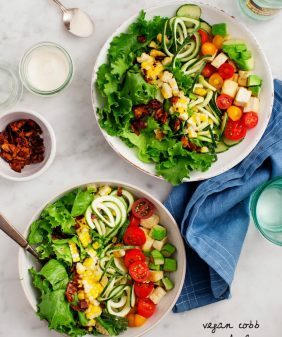 Love how creative you are with bowl meals and reusing leftovers! This was quite possibly THE best recipe I’ve ever made from your site!!!! We doubled the sauce and didn’t have pickled ginger so we grated in some fresh ginger into the dressing. Can’t wait to see the next recipe! 10/10 would make again and my husband said it’s among the best meals I’ve ever made! I need to try this bowl ASAP! So glad to see this series return, I loved the first round!! All I can say is yum! Mango isn’t something I would have thought to have put in a dish like this, but I can see it would go. This is super healthy too! Made this for dinner tonight for omnivore son and husband. I am vegan. My college son wolfed it down, with his steak. My husband and I found the bowl super satisfying.The dressing was the bomb! Made the whole thing come together. I added some lentils and quinoa, radishes and pickled onions. Omitted the green beans. Like I said the dressing is the winner here. Thanks for your inspiration. Is this meant to be served warm or cold? warm rice, cold everything else? I guess either is ok but wondering what the intention was? Thanks! Hi Elissa, I like to eat these with the rice warm or room temp, the beans at room temp, and everything else fairly cold. Hope that helps! It does thanks! I love your blog and cookbook so much! Made this tonight. It is absolutely delicious!Love how all the flavors work together, and it is so refreshing. Your receipts are winners. Made the overnight oatmeal with strawberry/rhubarb – my husband loves this, his new favorite. Thanks for sharing your receipts with us. I had everything except the mango, so ran to Trader Joe’s to pick up bag of frozen. Followed the recipe pretty closely, except used cauliflower rice and added a bit of ginger to the dressing. I’ve made up a double batch, so have lunch for the week. Oops! Just remembered the basil. I have tons of holy basil growing, so will try to remember it tomorrow, since I’ve already eaten today’s. Like I said, I couldn’t wait. Quite tasty and satisfying. Fills that desire for fresh. Mine wasn’t so pretty, so didn’t send a pic. Is there a link to the grocery list for the 3-day meal plan that includes the tacos and nori somewhere? This was so delicious! I read the recipe then immediately left my house to get the remaining ingredients I needed because I knew this was going to be my new favorite meal. And it did not disappoint! So fresh and bright. This will always be in our rotation now, thank you!